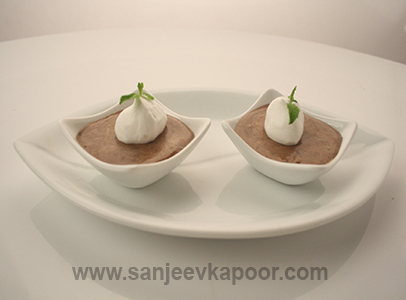 Milk, dark and white chocolates melted, mixed with gelatin and whipped cream to make a fantastic mousse. 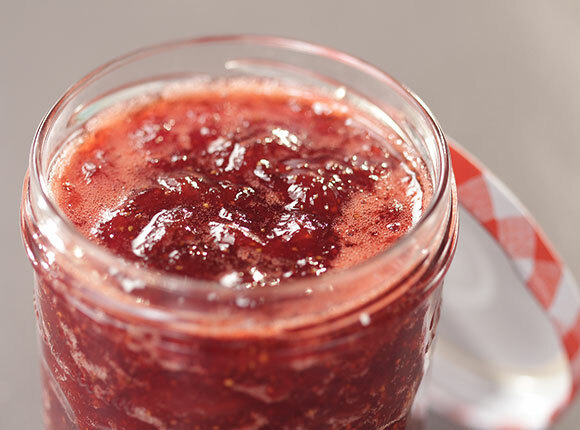 Chocolate pudding served with strawberry jam. 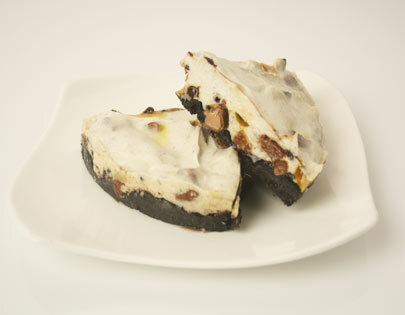 Base of chocolate cookies topped with a mixture of gum candies, cream cheese and double cream. 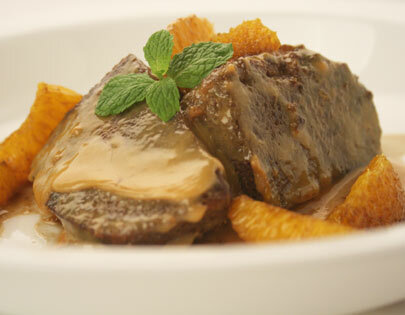 Caramalised condensed milk and orange, a combination that is simply irresistible. 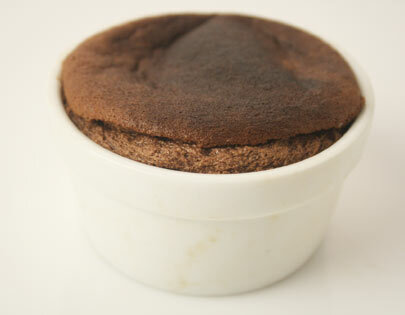 Chocolate Soufflé - How to make Chocolate Soufflé. 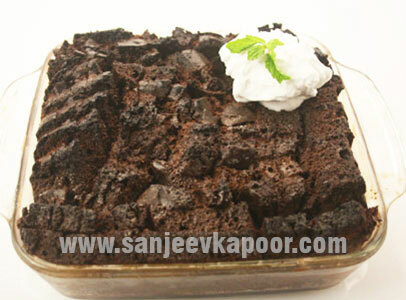 Everybody's favourite - chocolate flavoured souffle. 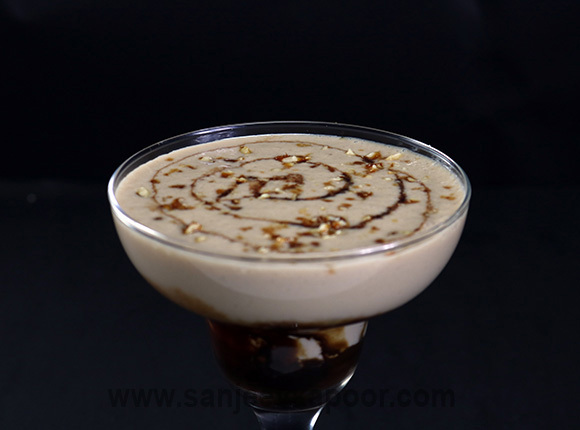 Chocolate Peanut Butter Shake - How to make Chocolate Peanut Butter Shake? 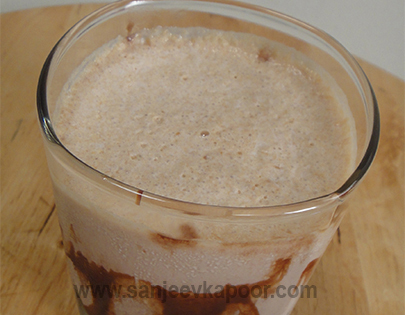 Delicious chocolate milk shake further enhanced with peanut butter and peanut chikki. 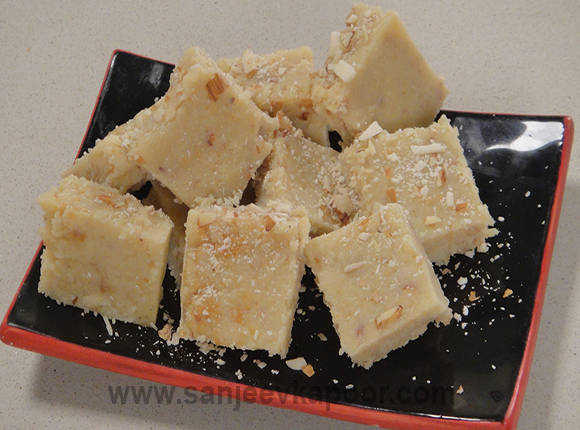 White Chocolate and Almond Fudge - How to make White Chocolate and Almond Fudge? 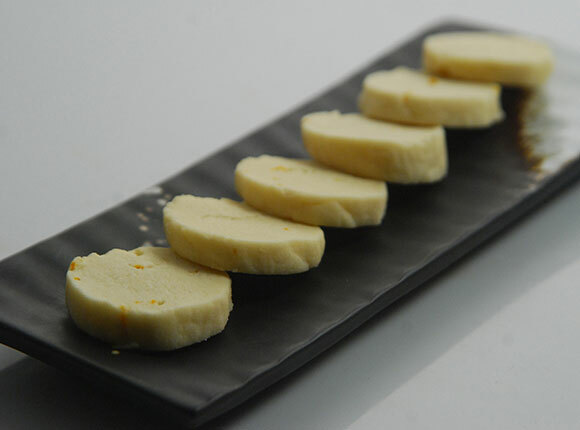 This white chocolate fudge gets an Indian touch with mawa. 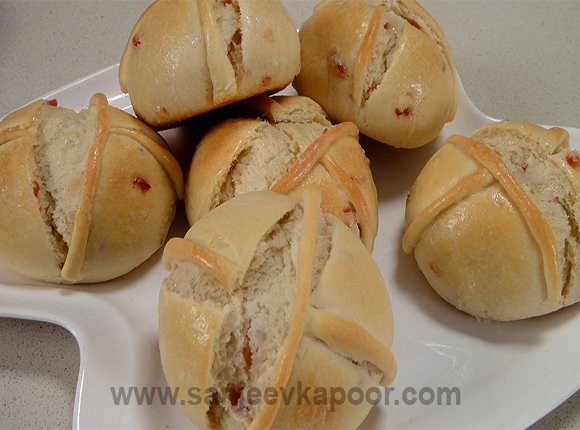 Hot Cross Buns - How to make Hot Cross Buns. 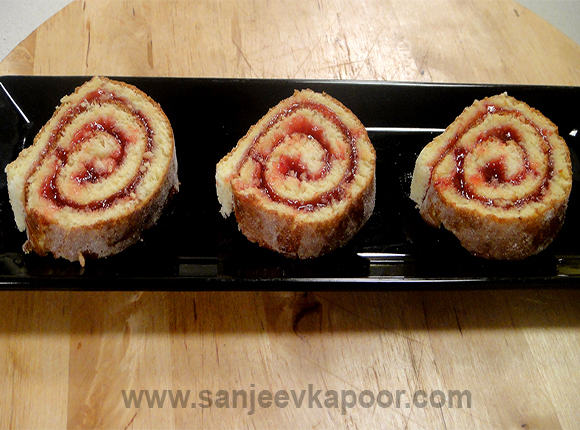 Jam Swiss Roll - How to make Jam Swiss Roll. 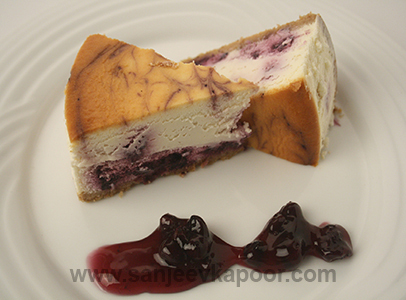 Sponge cake spread with mixed fruit jam, rolled and cut into slices. 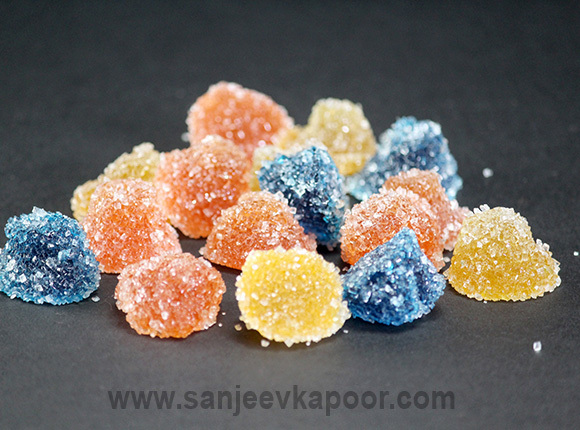 Jelly Squares - How to make Jelly Squares. 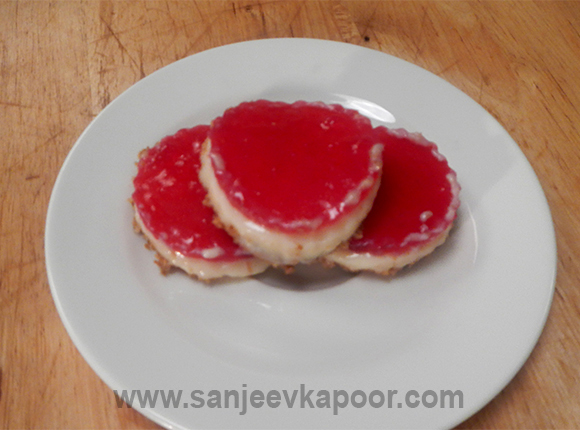 This jelly and biscuit delight is absolutely divine – try it out and you will never regret it. 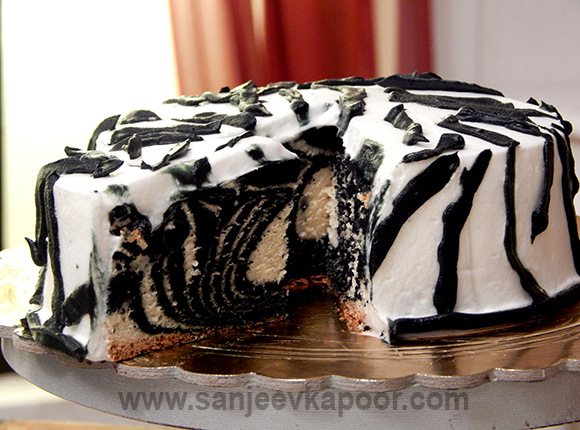 Zebra Cake - How to make Zebra Cake. White coloured and black coloured cake batter put into a cake tin one after the other and swirled to give zebra effect. 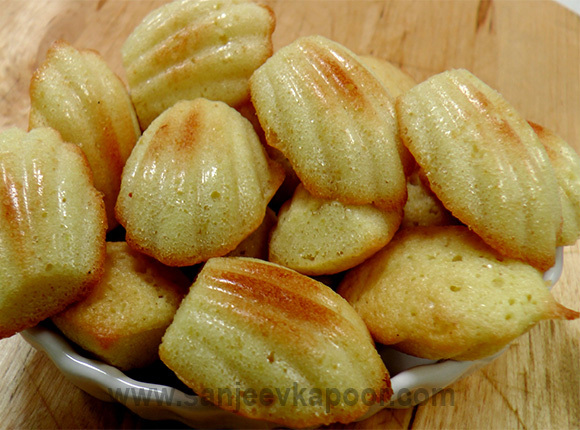 Madelines - How to make Madelines. 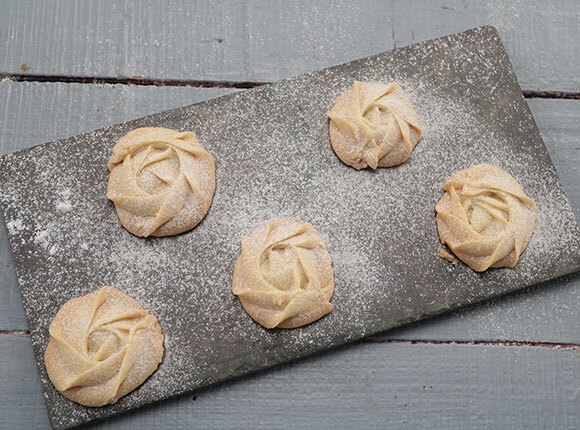 These are shell shaped French butter cookies. 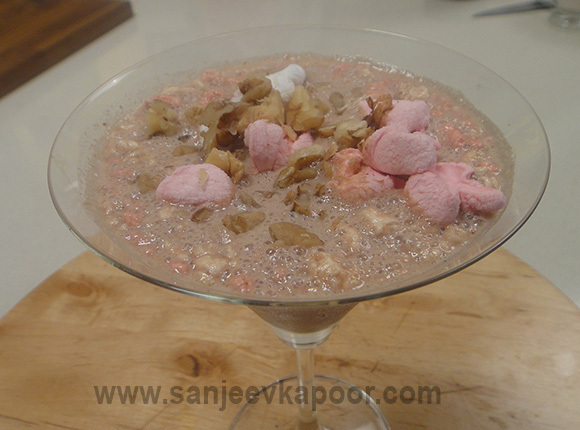 Rocky Road Shake - How to make Rocky Road Shake. 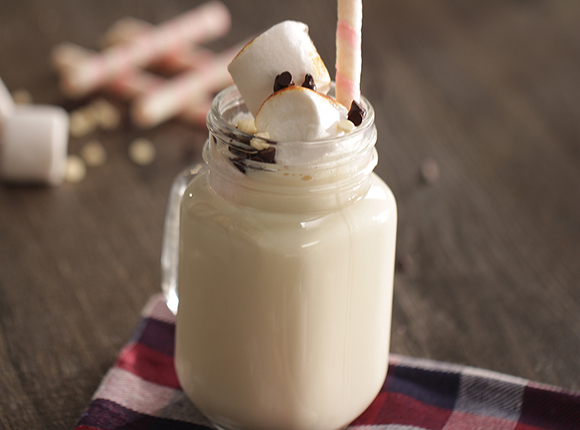 Marshmallow and chocolate ice cream shake – you will keep licking your lips. 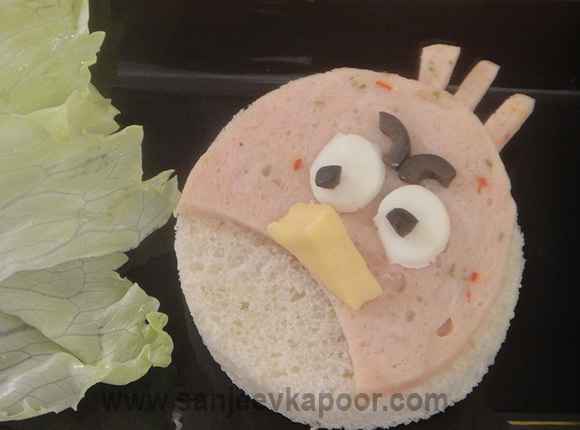 Salami Open Sandwich - How to make Salami Open Sandwich. 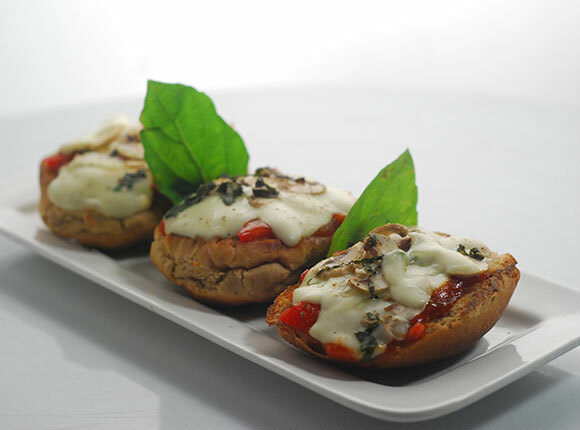 The kids will simply love these sandwiches made with salamis, cheese and black olives. 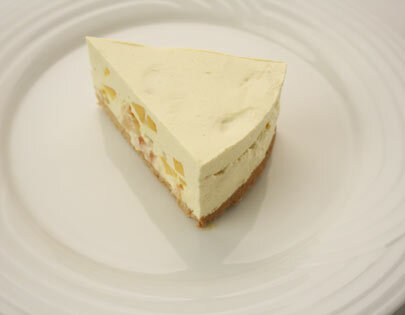 Soft Centered White Chocolate - How to make Soft Centered White Chocolate. 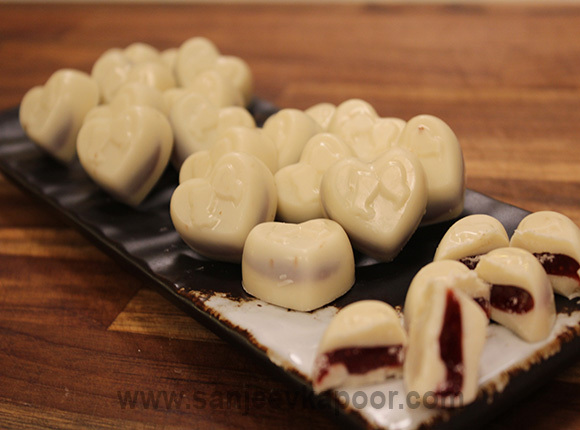 White chocolate cases stuffed with stewed strawberries and set. 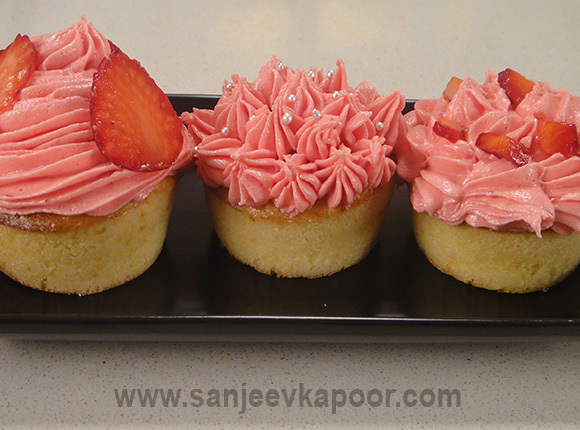 Strawberry Fairy Cakes - How to make Strawberry Fairy Cakes. The kids will simply love these lovely strawberry flavoured cupcakes with strawberry coloured icing. 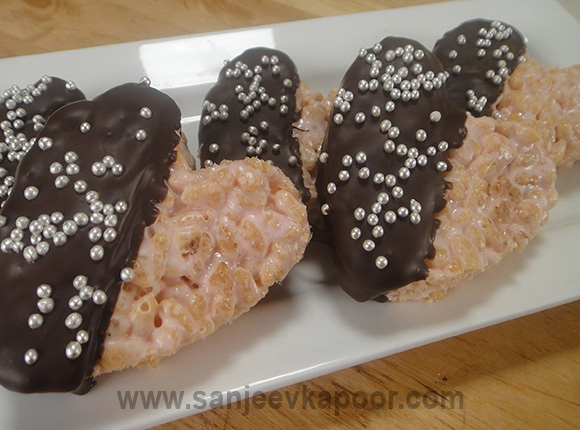 Sweet Crunchy Hearts - How to make Sweet Crunchy Hearts. 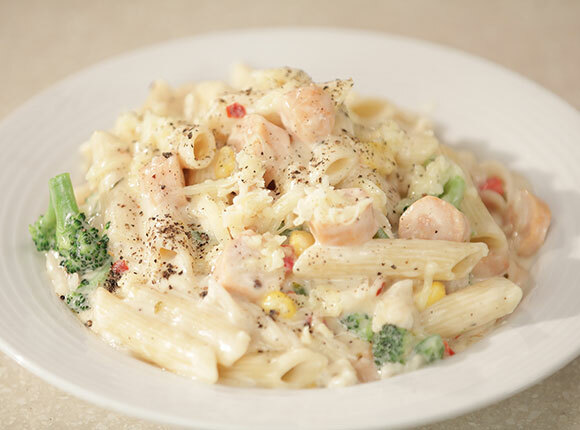 Your pride and your kids’ delight – they will simple love these little hearts. 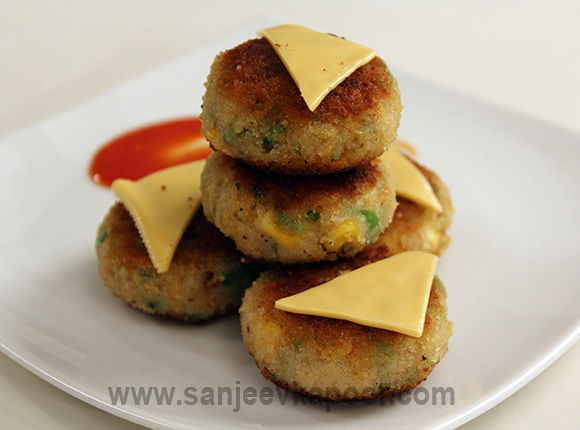 Sweet Potato and Corn Fritters - How to make Sweet Potato and Corn Fritters. 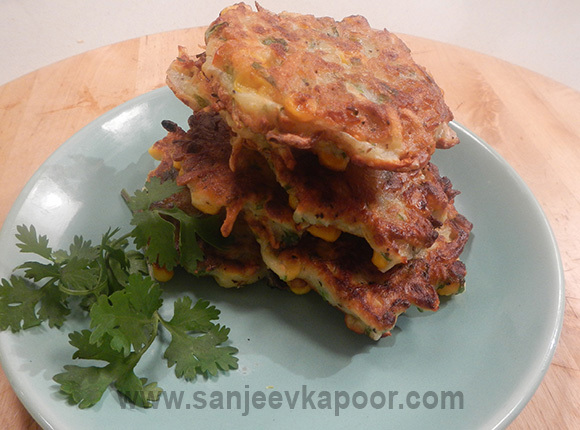 Absolutely lip-smacking are these sweet potato and corn fritters. Valentine Hearts - How to make Valentine Hearts. 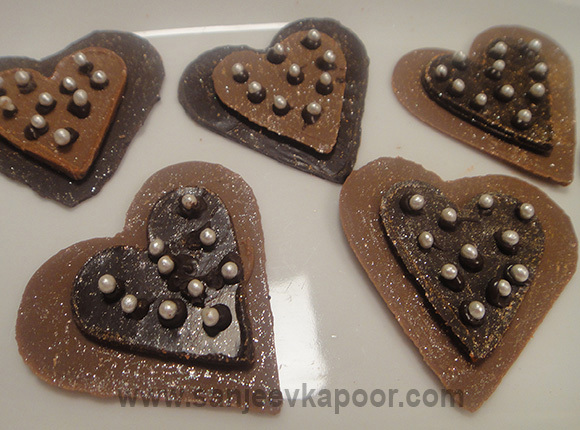 Make these chocolate hearts not just for your valentine. 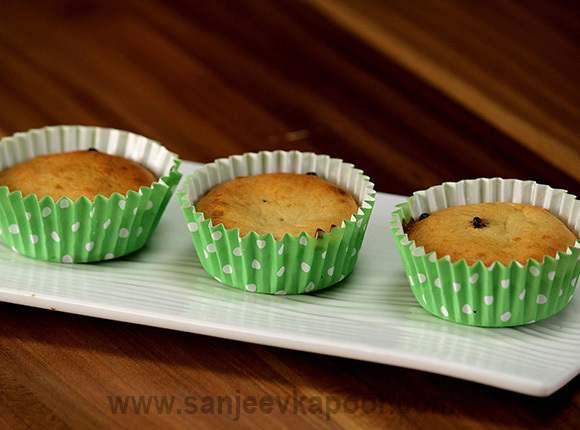 Banana and Coffee Muffins - How to make Banana and Coffee Muffins. 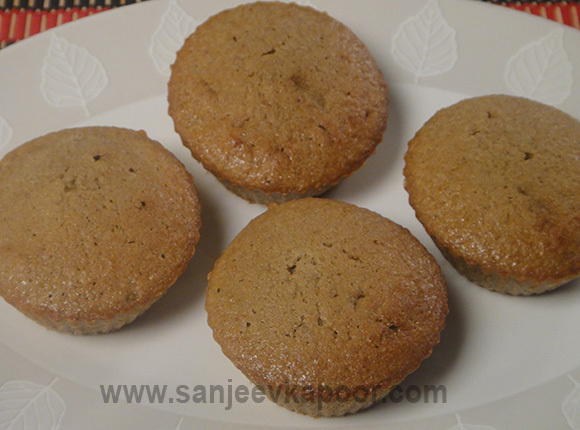 The sweetness of bananas and flavour of coffee powder make these muffins absolutely delicious. 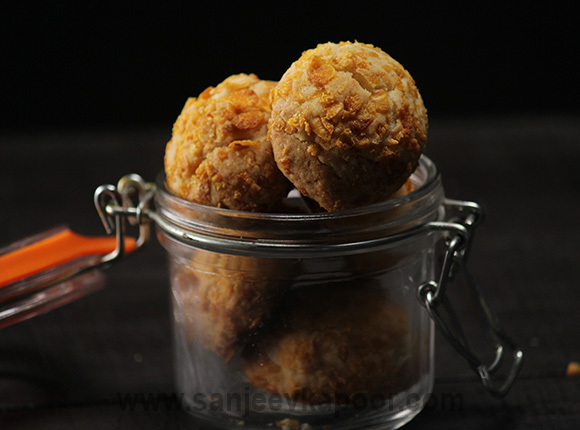 Basic Cookie Dough - How to make Basic Cookie Dough (Butter Cookies). 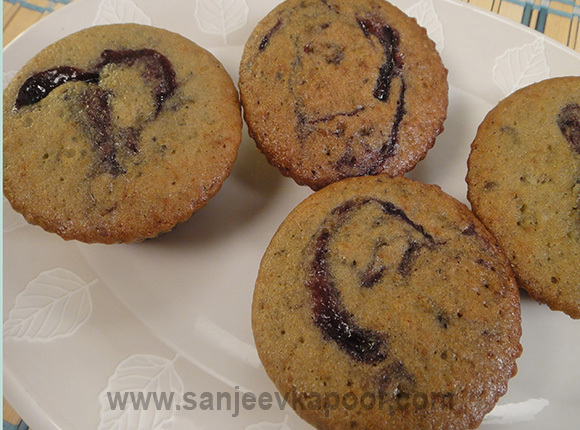 Blueberry Buttermilk Cupcakes - How to make Blueberry Buttermilk Cupcakes. 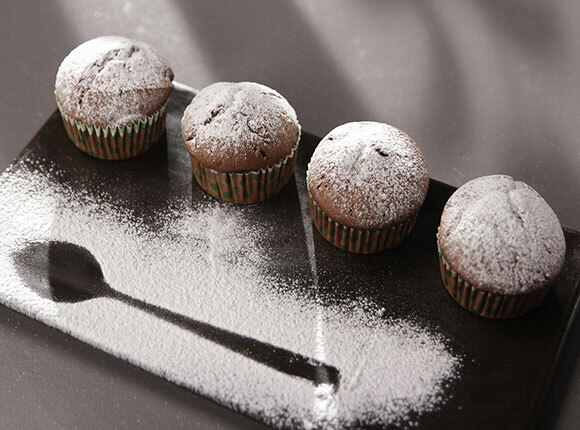 You will enjoy these cupcakes so much that you won’t stop at one. 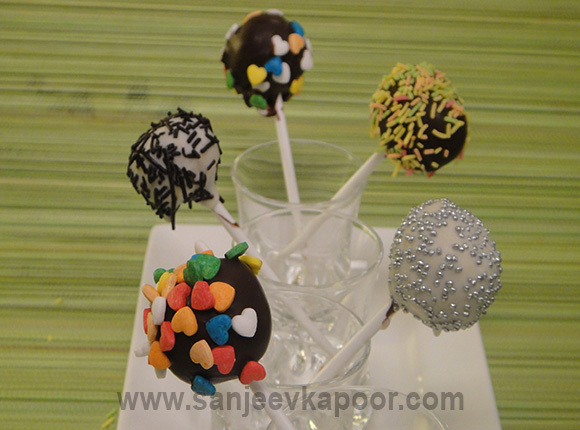 Cake Pops - How to make Cake Pops. Your kids will simply love these cake pops. 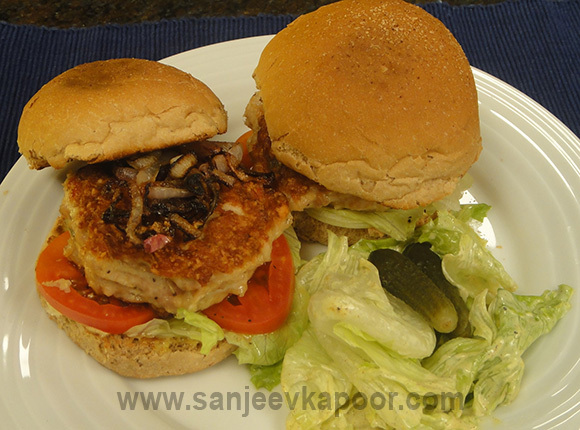 Cheese Stuffed Chicken Burger - How to make Cheese Stuffed Chicken Burger. 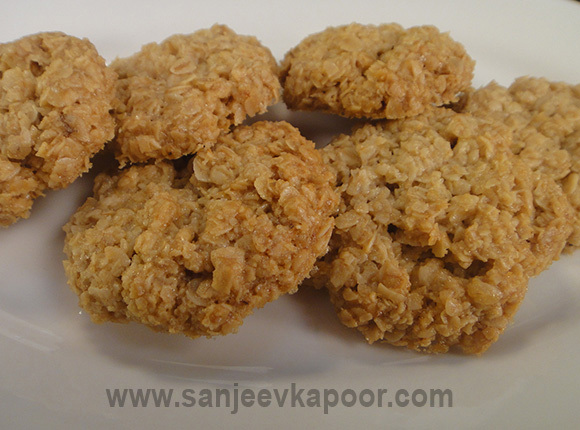 Chewy Oat Cookies - How to make Chewy Oat Cookies. 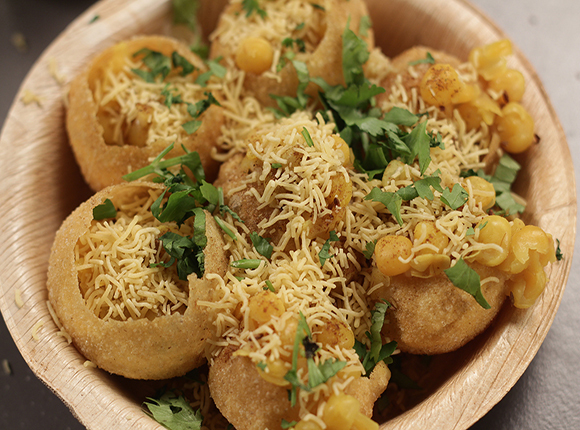 It is so difficult to believe that something which is so easy to make can be so tasty. 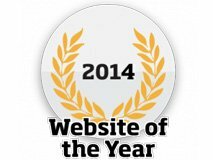 Chilled Watermelon and Yogurt Smoothie - How to make Chilled Watermelon and Yogurt Smoothie. 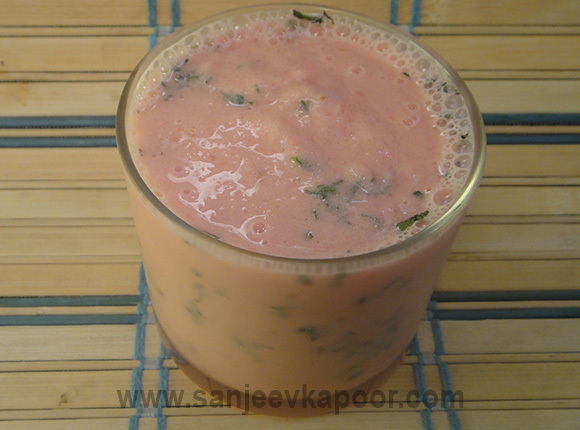 Frozen watermelon chunks blended with yogurt, honey and mint. 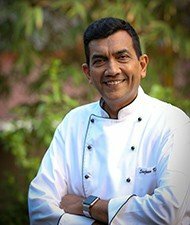 Choco Cookies - How to make Choco Cookies. 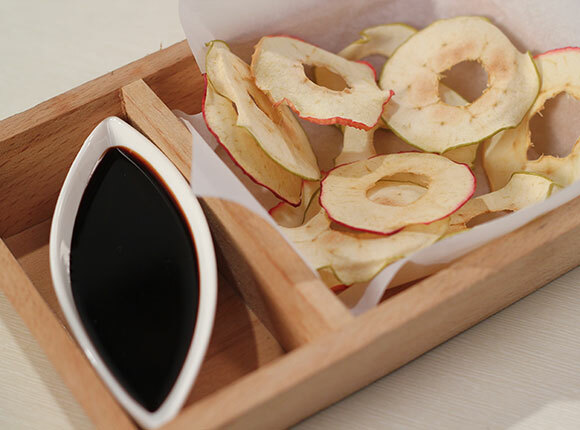 Your kids will be delighted with these cookies. 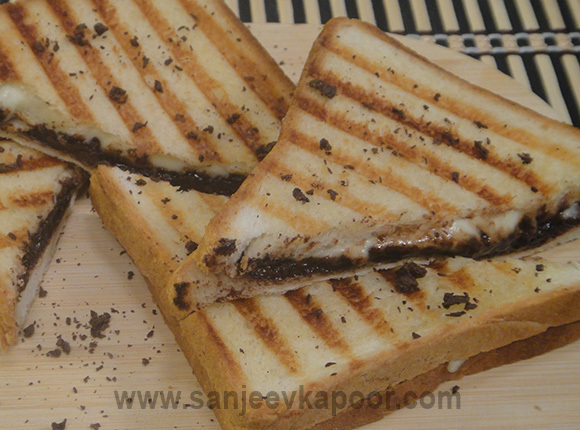 Chocolate and Cheese Sandwich - How to make Chocolate and Cheese Sandwich. 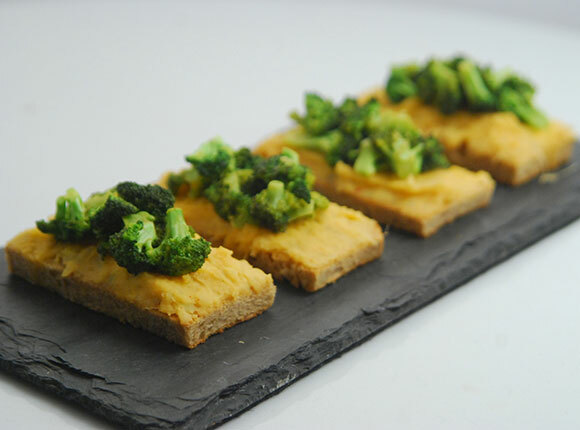 Chocolate combines well with cheese to make delicious sandwiches – your kids will love them. 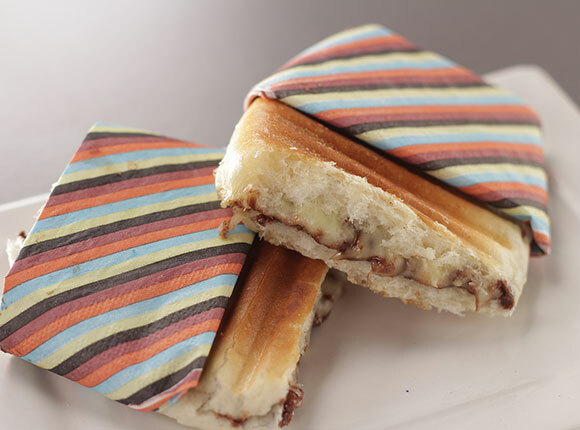 Chocolate and cheese are great pair in a sandwich. 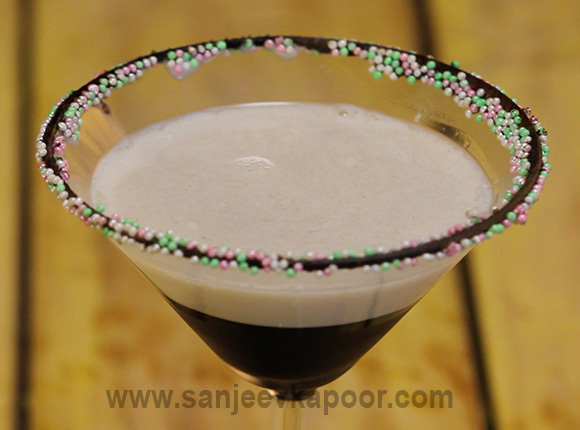 Chocolate and Strawberry Milk Shake - How to make Chocolate and Strawberry Milk Shake. 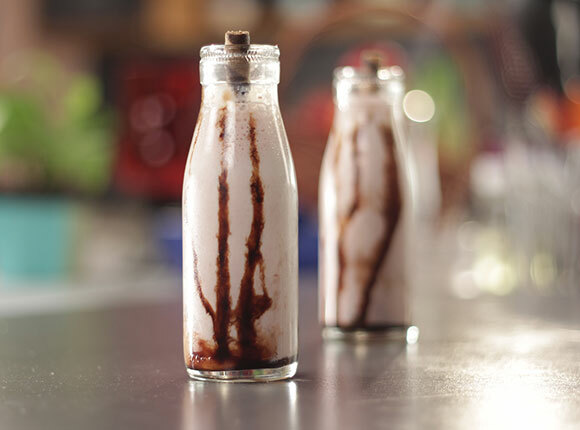 Chocolate ice cream and strawberry crush blended with milk to make a delicious milkshake. 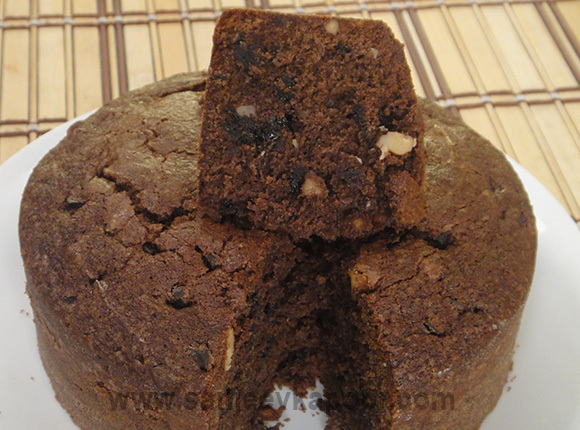 Chocolate and Walnut Cake - How to make Chocolate and Walnut Cake. 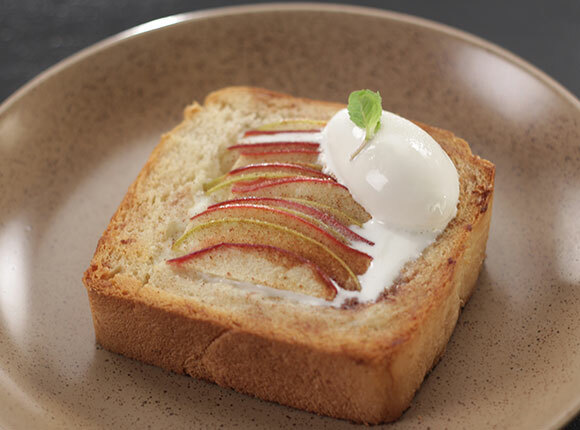 Walnut adds a delightful flavour and crunch to this delicious cake. 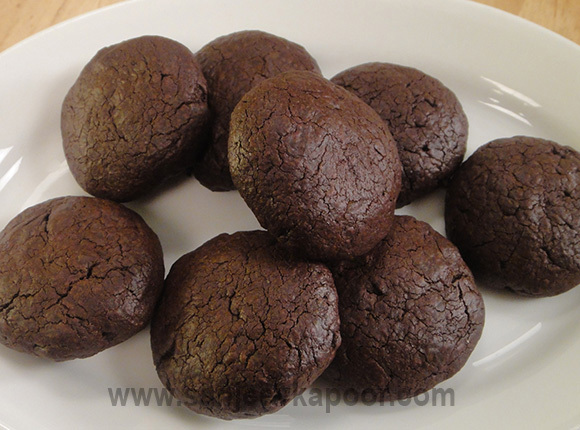 Chocolate Cookies - How to make Chocolate Cookies. 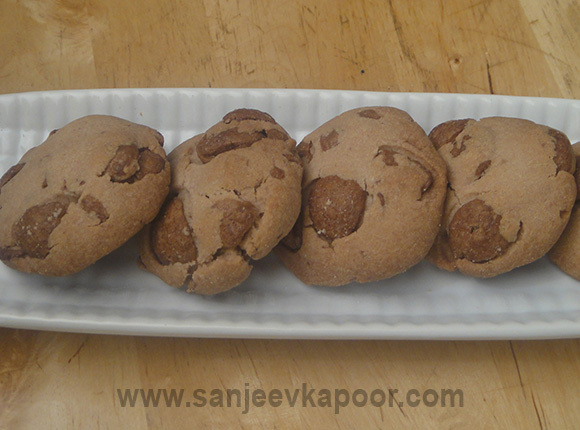 These delicious chocolate cookies will improve your kid's mood in a jiffy. 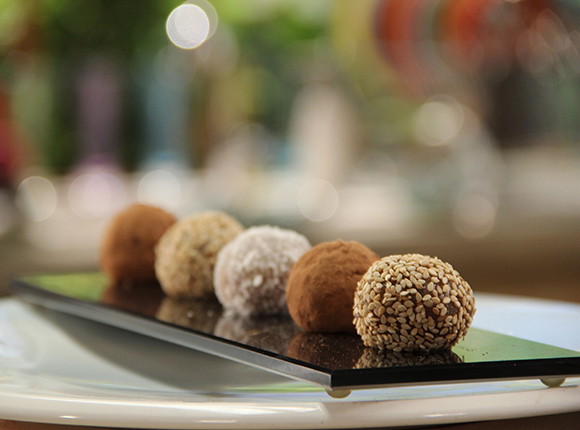 Chocolate Cups - How to make Chocolate Cups. 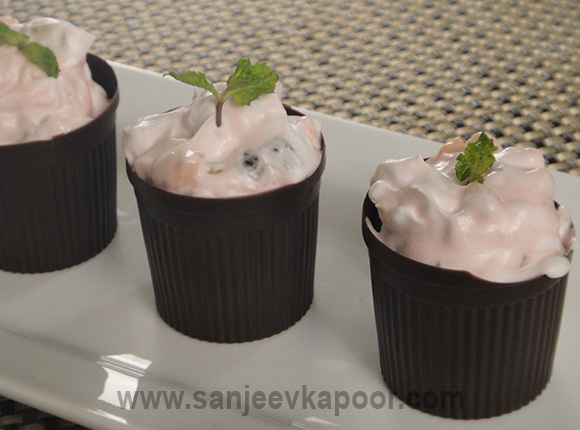 Chocolate cups filled with fruits mixed with cream and strawberry crush. 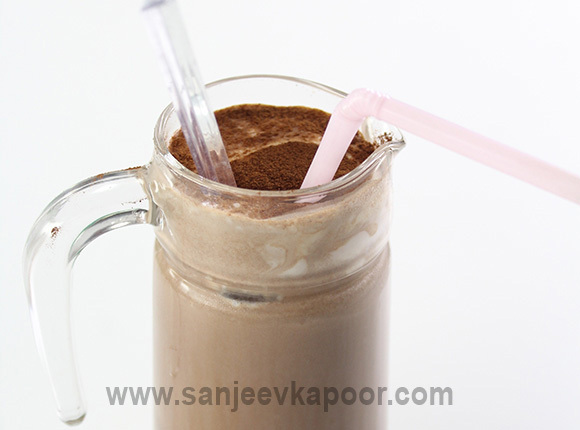 Chocolate Hazelnut Milshake - How to make Chocolate Hazelnut Milshake. 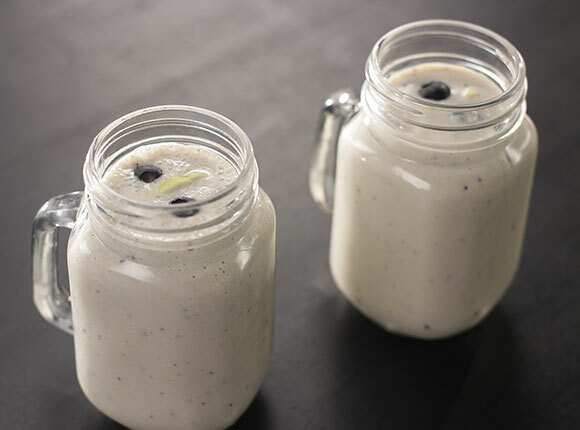 The nuttiness of hazelnuts makes this milkshake extremely tasty. 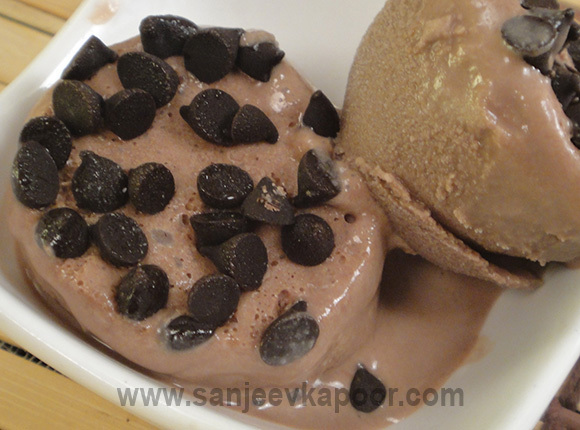 Chocolate Chip Icecream - How to make Chocolate Chip Icecream. 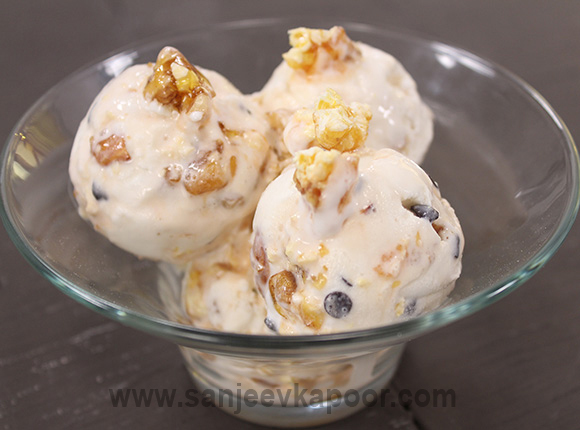 With every spoon of this ice cream you get the delicious crunch of chocolate chips. 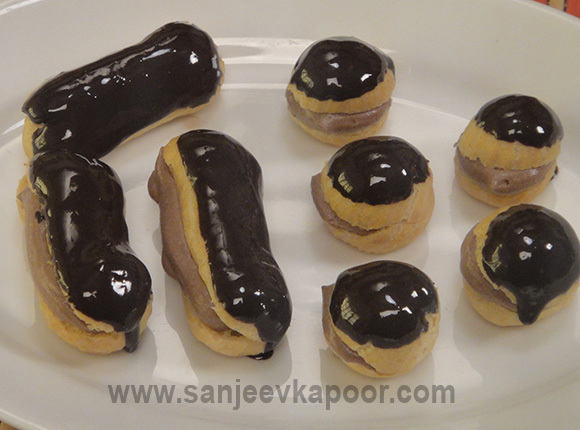 Chocolate Profiteroles and Eclairs - How to make Chocolate Profiteroles and Eclairs. 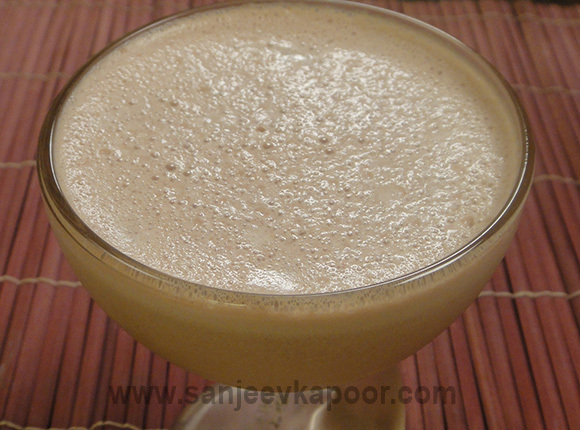 Banana Naougat Smoothie - How to make Banana Naougat Smoothie. 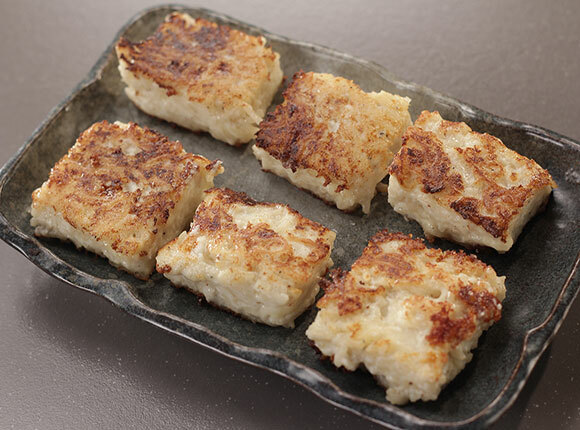 Bananas blended with yogurt, milk, honey and served topped with crushed nougat. 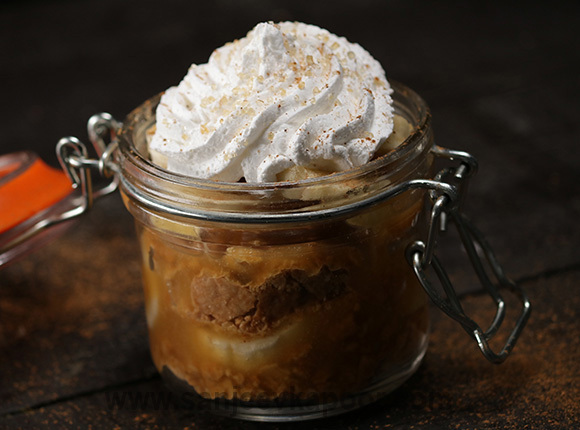 Banoffee Pie Jars - How to make Banoffee Pie Jars. 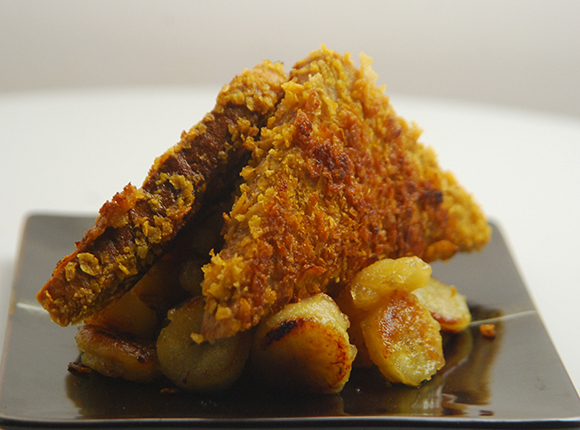 Crunchy, full of banana flavour – the kids will simply love this. 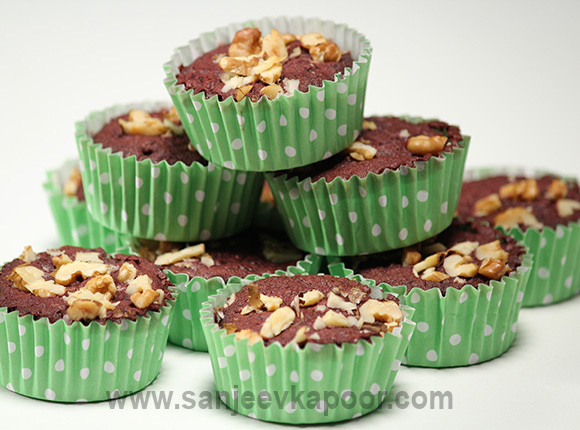 Beetroot Brownie Cupcakes - How to make Beetroot Brownie Cupcakes. 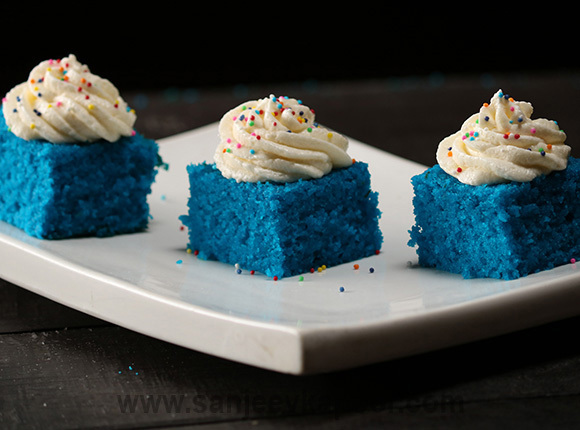 Blue Velvet Cake - How to make Blue Velvet Cake. 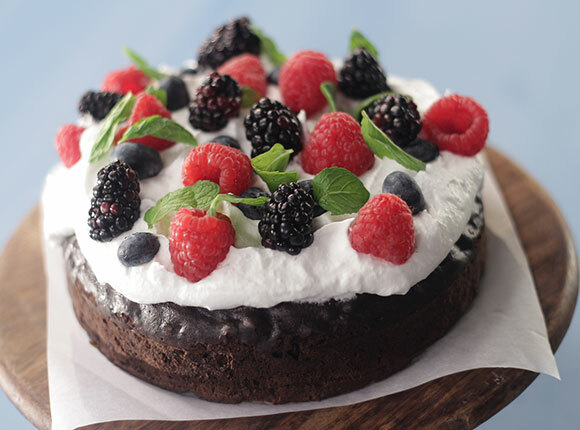 Whatever the colour, this velvet cake is just as tasty. 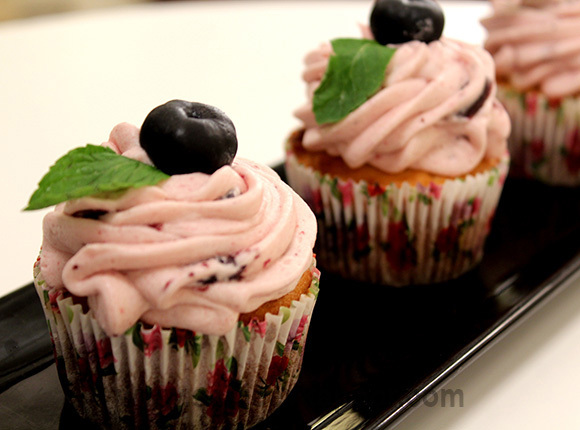 Blueberry Cupcakes with Blueberry Frosting - How to make Blueberry Cupcakes with Blueberry Frosting. It’s blueberries all the way – in the cupcakes as well as in the frosting – deliciously different. 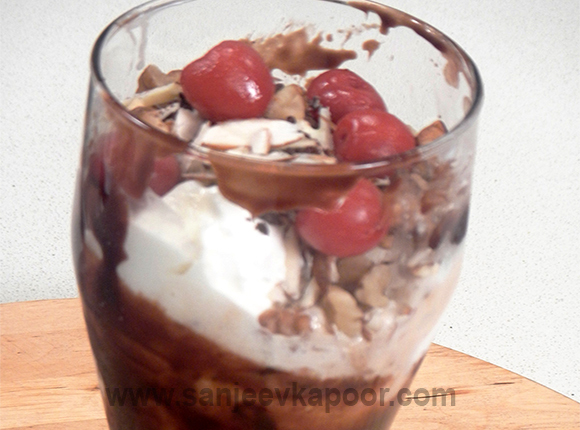 Brownie Trifle - How to make Brownie Trifle. 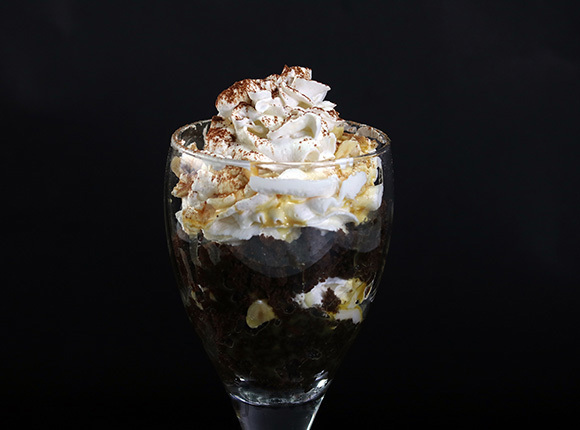 Brownie crumbs, cream cheese mixture, chopped hazelnuts and caramel sauce layered in glasses and served. 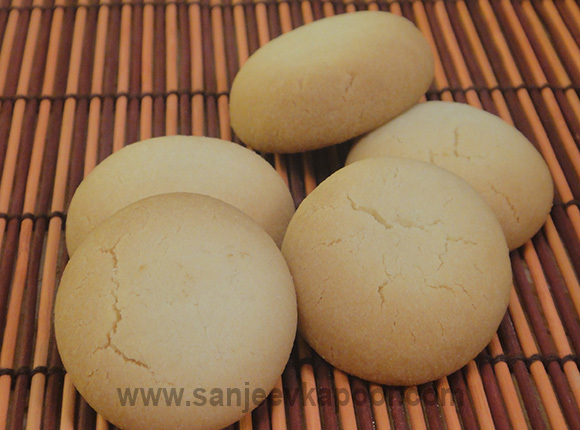 Karachi Biscuits - How to make Karachi Biscuits. 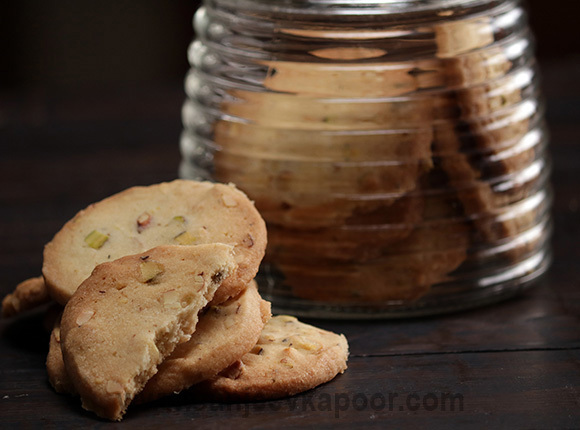 A sweet biscuits enriched with chopped mixed nuts. 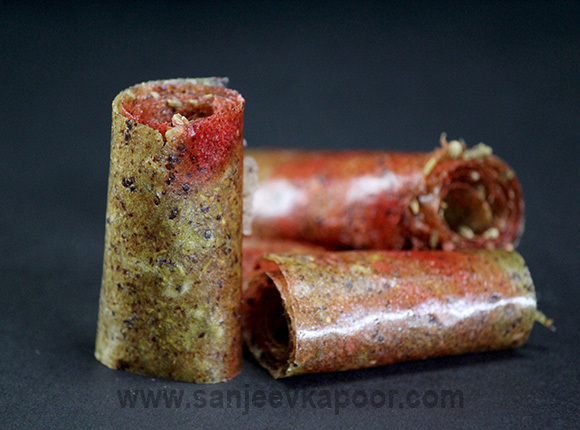 Kiwi Strawberry Leather - How to make Kiwi Strawberry Leather. 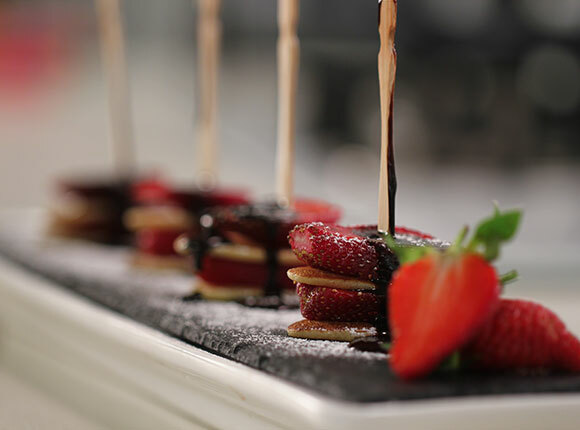 Kiwi and strawberry purees layered one over the other and baked, cut into strips and rolled. 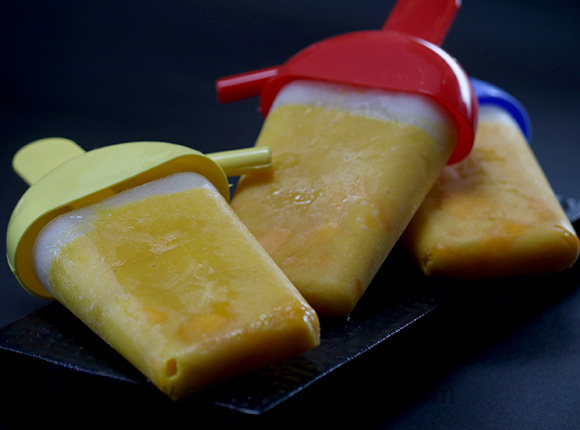 Mango Popsicles - How to make Mango Popsicles. 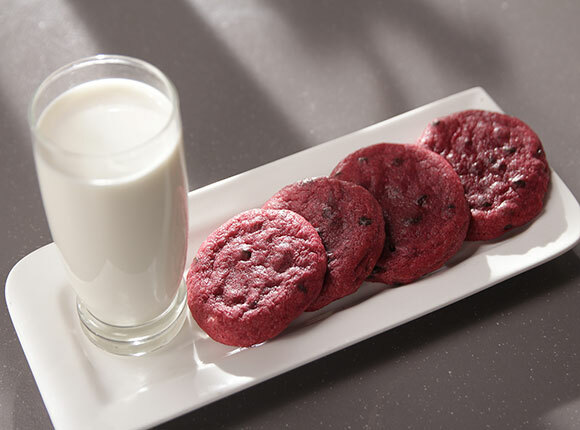 Marble Cookies - How to make Marble Cookies. 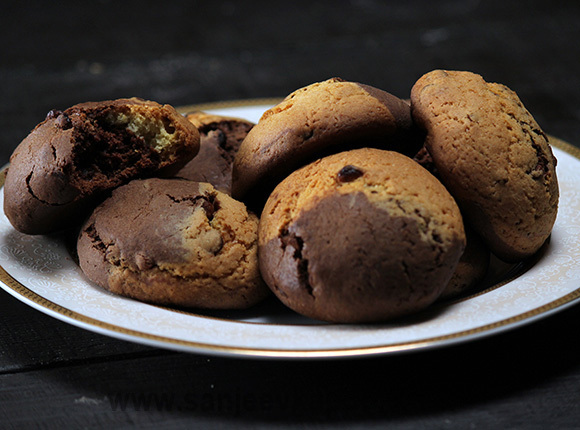 Chocolate cookies with marble appearance. 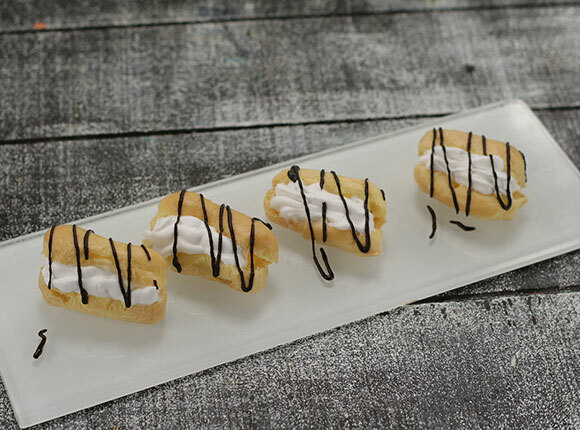 Melting Moments - How to make Melting Moments. 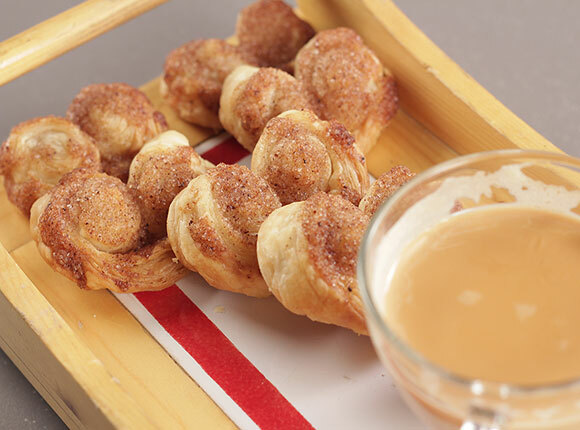 These cookies are literally melt in the mouth and hence the name. 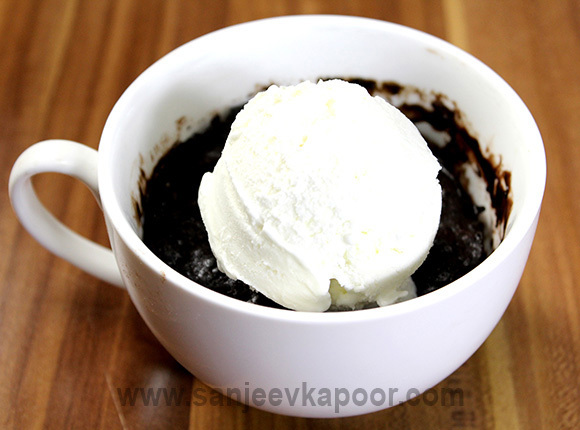 Mug Cake - How to make Mug Cake. 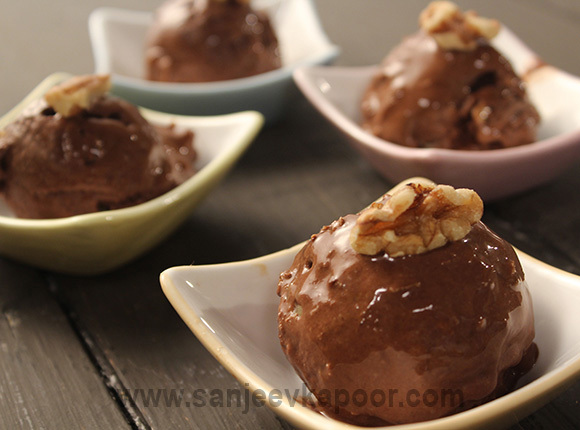 This is a quick, easy and super delicious way to enjoy chocolate with vanilla ice cream. 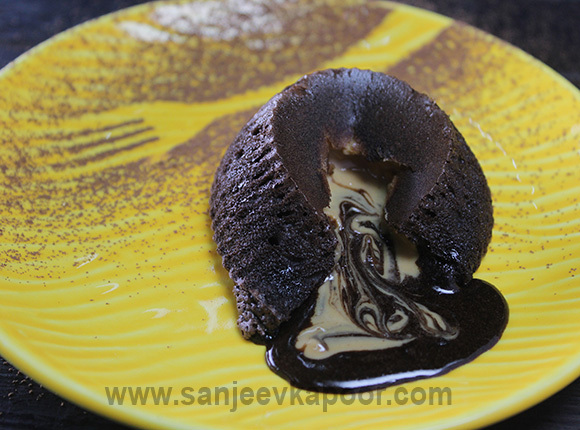 Molten Marble Cake - How to make Molten Marble Cake. These cupcakes have marble effect and when cut molten peanut butter just oozes out – delicious. 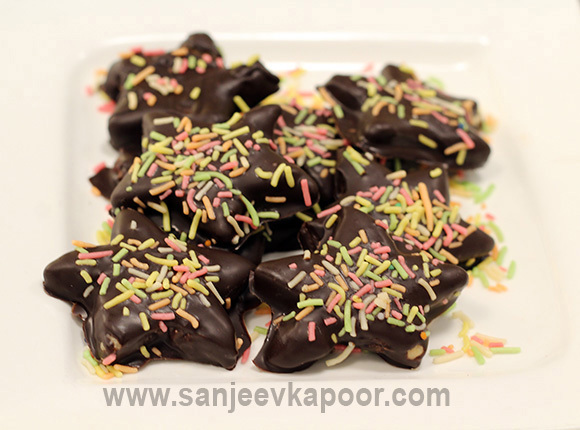 Peanut Butter Chocolates - How to make Peanut Butter Chocolates. 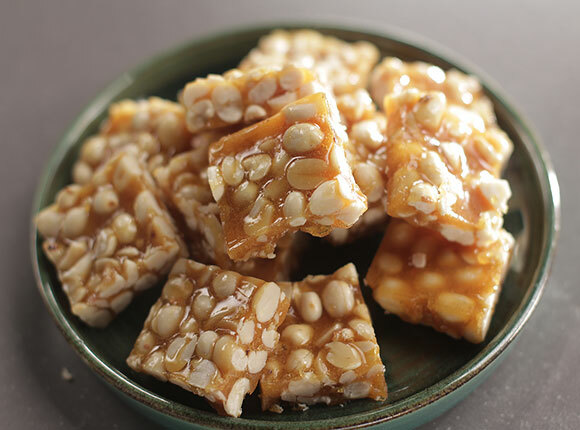 One bite into the chocolates will give you the taste of caramel and peanut butter.- homemade Peanut Butter Chococlate are easy to make from scratch. 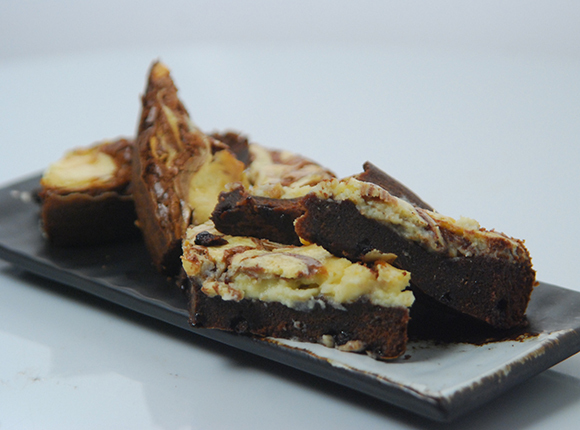 It cannot be denied that peanut butter and chocolate are a match made in heaven! 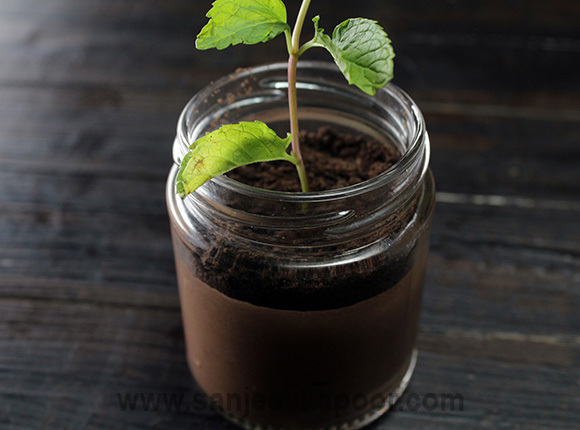 Plant in a Jar - How to make Plant in a Jar. 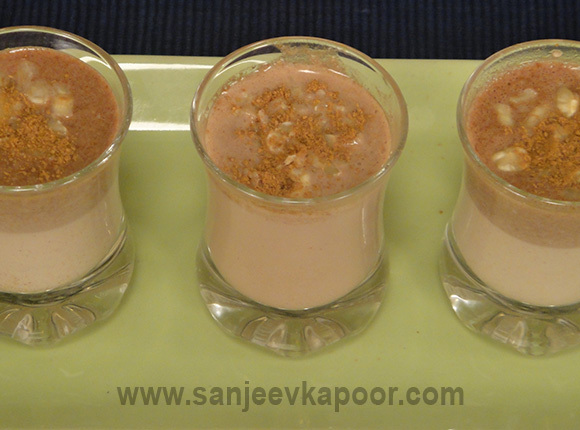 Chocolate-hazelnut mousse served in jars topped with chocolate cookie crumbs.  Sweet Rush - How to make Sweet Rush. 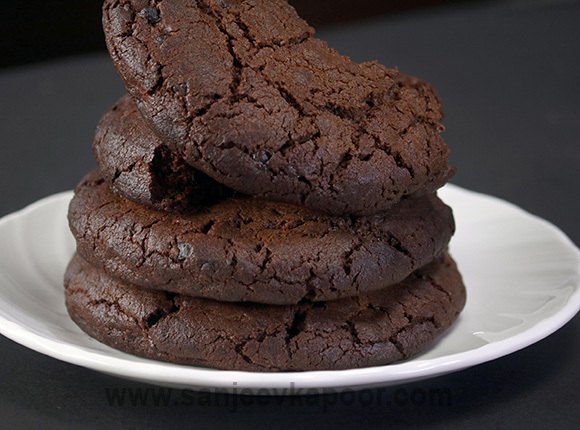 Triple Chocolate Cookies - How to make Triple Chocolate Cookies. 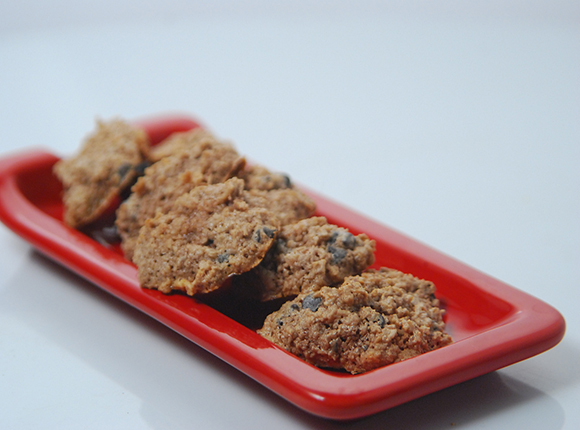 These cookies have an overload of chocolate – white and dark chocolate chips and cocoa powder. 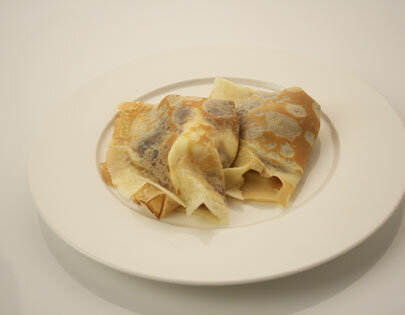 Chocolate Jumbles with Caramel - How to make Chocolate Jumbles with Caramel. 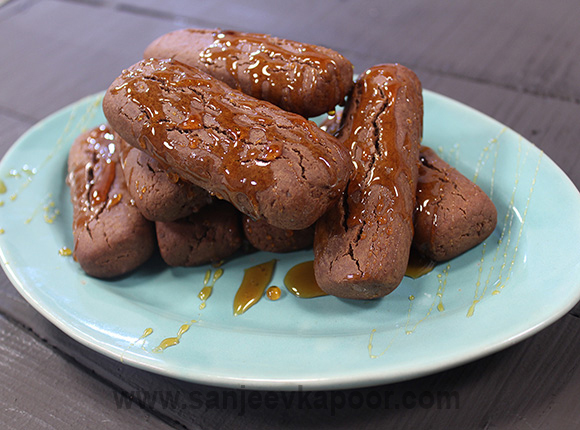 Chocolaty logs baked, drizzled with golden syrup and served. 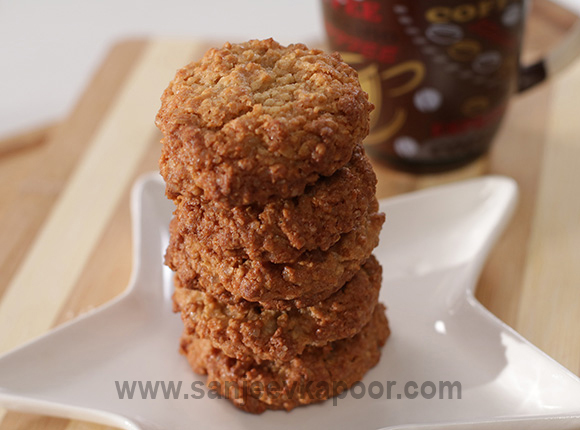 Maple Oatmeal Cookies - How to make Maple Oatmeal Cookies. 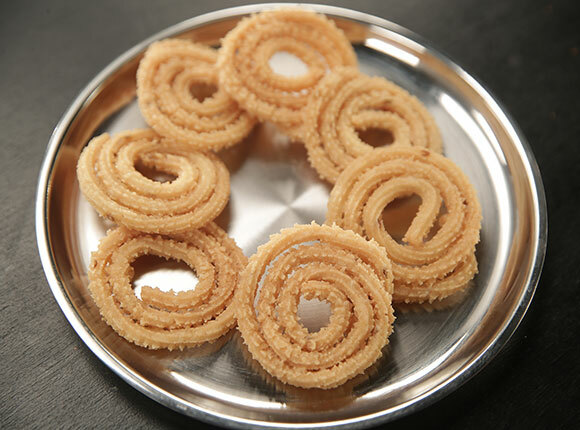 Rich in fibre these cookies are simply delicious. 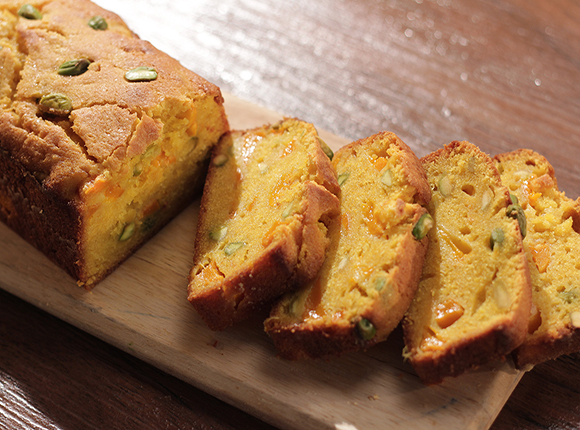 Pumpkin Seed Cookies - How to make Pumpkin Seed Cookies. 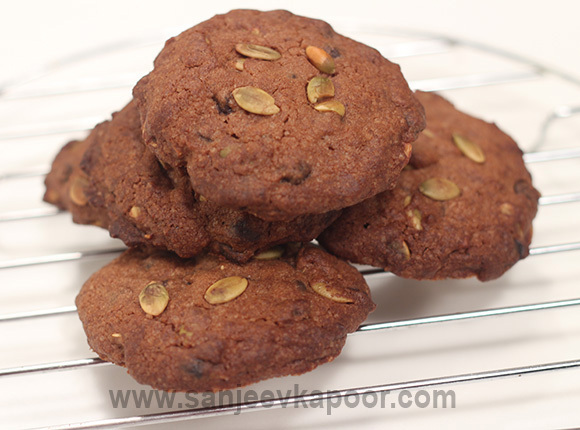 Roasted pumpkin seeds give these cookies a wonderful flavour and a delicious crunch. 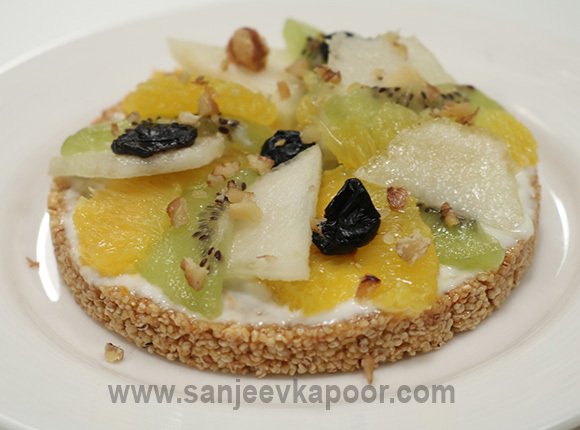 Rajgira Fruit Pizza - How to make Rajgira Fruit Pizza. 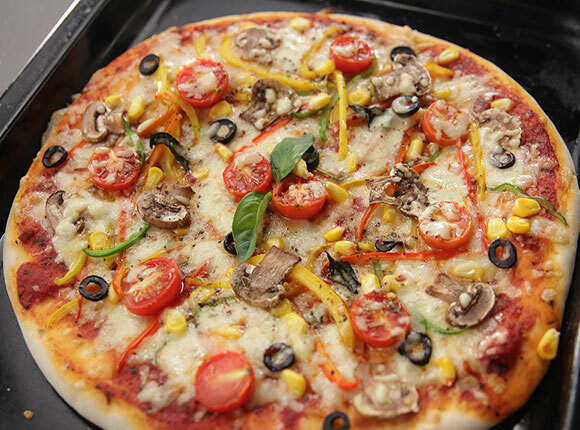 This is a completely healthy pizza made with amaranth seeds used for the base and topped with a medley of fruits . 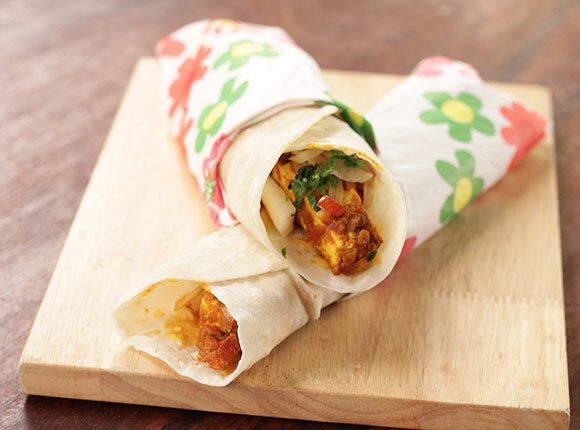 Whenever you want to pamper your children just make these stars – don’t worry they are nutritive too. 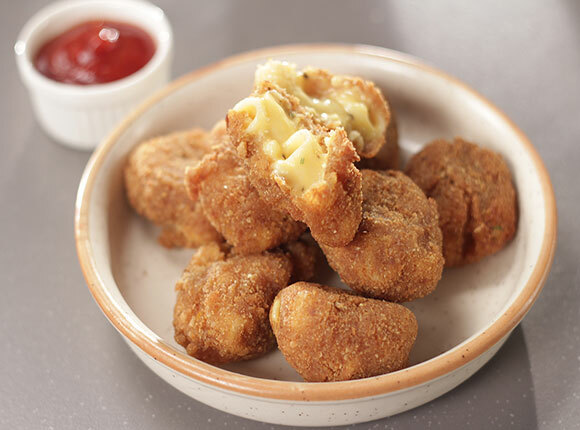 These are absolutely delicious! 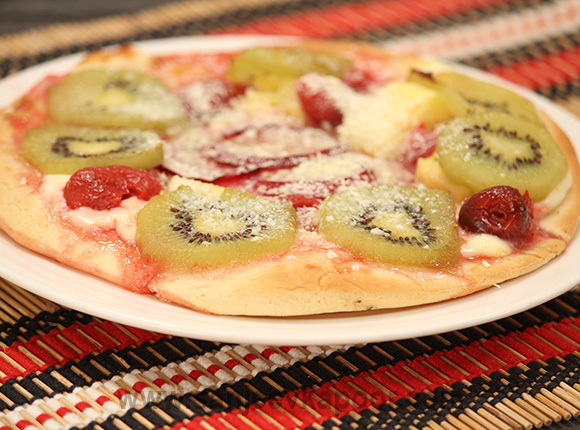 A sweet pizza – topped with jam, cream cheese and fresh fruits.